The family drama Fences is powerful but needs a serious edit. In his long and glorious career, Actor Denzel Washington has made his Modus Operandi clear: choose powerful but flawed characters and fill them with a special intensity to make them memorable. His third film as a director - the family drama Fences - features similar but no less impactful performances, hoping to establish itself among a dearth of Oscar hopefuls. Unfortunately, Washington's effort is as deeply flawed as the characters he chooses, meandering through a lazy script that fails to know when it either needs a mere shave or a full-on cut. For trash collector Troy Maxson (Washington), life in 1950's Pittsburgh is more about celebrating the end of the day than worrying about how hard he's actually working. He likes to drink in his backyard with friend Jim (Stephen Henderson) while wife Rose (Viola Davis) prepares dinner. Rose has an expectation that Troy will build a wooden fence for her in the backyard, so he enlists his unwilling son Cory (Jovan Adepo) to help. Unfortunately, the dynamics between them have become strained, as Cory's aspiring football career has been shot down by the tough-minded dad, who expects Cory to work instead. Troy must also deal with his son from a previous marriage (Russel Hornsby), who's constantly asking for handouts. Buried deep inside Troy's force-of-nature attitude is a secret that will eventually destroy the Maxson home, pitting son and wife against him, all while the fence continues to be unfinished. 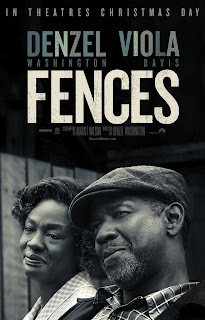 Fences is expertly acted; that's apparent from the first few moments. But after a long monologue where Washington dominates the screen, it's also apparent that this film is going to take its sweet time before giving in to the credits. That hampers what could have been a powerful commentary on the family power scheme and those who desire to take it away. Washington and Davis enjoy excellent chemistry, inhabiting these characters with a sense of history that only people of this skill level can perform. They're one of the best on-screen duos I've seen this year, effortlessly gliding between the familiar nature of a loving relationship and bruising each other with their intensity as the movie progresses. Supporting performances are also excellent (Adepo especially), as he attempts to wrestle away his father's hardened control over him. Production design is flawless, exposing a 1950's Pittsburgh of emerging diversity that also reflects its steel town roots. Davis is one of my favorite female leads, proving her mettle on both television and film with weekly results. She grants Rose with the perfect 1950's woman, exposing every flaw in the period's DNA by sacrificing any hope for personal achievement to ride Troy's successes. When that comes crashing down, Rose is crushed, giving Davis another opportunity to push her extraordinary talents. By the time it's all done, we deride Troy and elevate Rose which perhaps is the point behind Fences. But that point is not made clearly, and it exposes the problems behind the film itself. Sadly, Fences suffers from two devastatingly avoidable issues. First, it needs a serious edit, going on for way too long and failing to tell us much by the end. Based on the play by August Wilson (who also wrote the script), it resolves into essentially nothing, forcing audiences to take on extended periods of dialogue that fail to connect to a larger point that just doesn't exist. True, we know more about our characters by film's end, but it's the classic "journey taken" plot that keeps Fences from attaining anything more. In his effort to tell the story of the flawed Troy, Washington exposes his own weaknesses as a director, failing to perhaps take the advice of veteran editor Hughes Winborne to hone his story into a tightly-woven commentary on the family power struggle. There's an Oscar movie here for sure, but Washington can't get out of his own way, failing to mature Fences from its roots as a low-rent play. Our test audience seemed to agree, as several of them actually fell asleep during the 2-hour+ film that should have been 30 minutes shorter. With a proper edit, Fences could have taken home Oscar gold, but its lackadaisical attitude and long (sometimes very long) sequences of dialogue stray the impact behind Washington's film. Its failure proves the importance that all aspects of film making (including editing) must be strictly enforced if you wish to create something special. For Fences, it's this one aspect that audiences will find unnerving and which unravels any hope for Oscar glory. 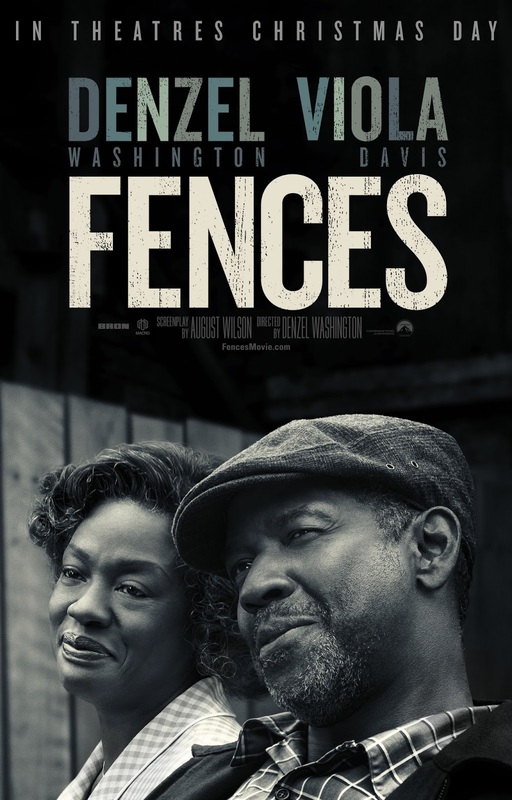 Fences is rated PG-13 for thematic elements, language and some suggestive references and has a runtime of 138 minutes.